Pour an ounce of prevention into your hot tub at least once a year! Schedule a Routine Hot Tub Service at least once a year to prevent hot tub electrical hazards, rust, rot & mold and rodent damage! Click to Schedule $95.00 Routine Hot Tub Service! 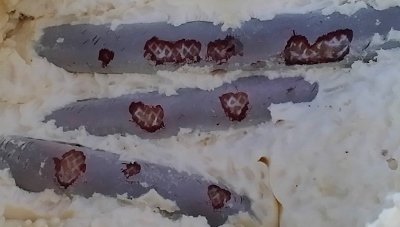 Bio-film is a bacterial slime layer that grows deep inside the complex pipes and plumbing of your portable hot tub. 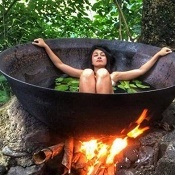 Bio-film grows in just about every hot tub especially if you have neck jets or waterfalls that have been shut off. If you have waterfalls, water features or jets that have not been flushed with fresh water for weeks, months or years, you surely have biofilm buildup in those plumbing lines. The dirty water stuck in stagnant plumbing doesn't get exposed to sanitizing chemistry so it's an ideal environment for biofilm growth. Shut off neck jets are a leading source of biofilm buildup in portable hot tubs. The dark, slimey goo shooting out the jets in the photo above also contianed sulphur dioxide making it smell foul like rotten eggs. You'll know you have bio-film in your portable hot tub when you see white flakes everywhere making your tub look like a giant snow-globe or when you're sitting in the tub and turn a diverter valve or open a closed jet and suddenly you're sitting in a dark, stinky cloud of bacterial slime. Bio-film flush uses specially formulated enzymes and detergents that dissolve slime deposits, power wash every inch of plumbing and purge every jet in every seat ensuring your next soak is soothing and sanitary. Click to Schedule $145.00 Routine Hot Tub Service! 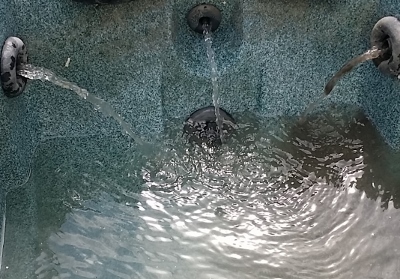 Vibrations from the powerful jet pumps used in most modern, portable hot tubs can loosen electrical connections over time. 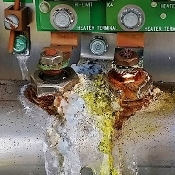 Loose electrical connections get hot enough to damage expensive circuit boards and sometimes start hot tub electrical fires. Click to schedule Routine Hot Tub Service! 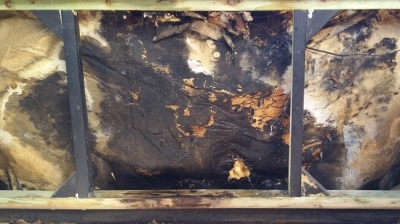 Hot tub electrical fires can smolder inside the insulated cabinet of your portable hot tub for hours or days before bursting into flames and pouring out clouds of toxic smoke once the plastic starts to melt and burn. Once all the plastic in a portable hot tub starts to melt it can burn very hot and can spread very fast. 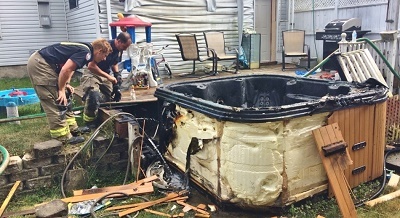 Fire inside an insulated, portable hot tub can be difficult to fully extinguish. 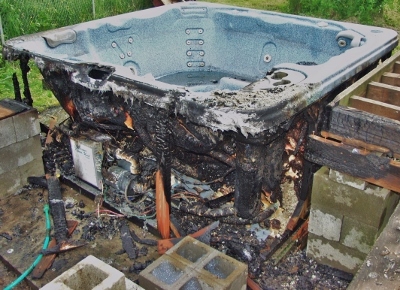 Don't let loose power connections in your hot tub damage expensive circuit boards or start an electrical fire! Schedule a routine hot tub service. The same vibrations that can loosen hot tub electrical connections can also loosen grounding and bonding connections. 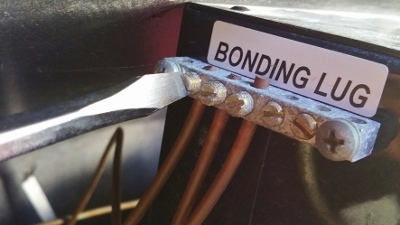 It's the grounding and bonding connections that keep the water safe by ensuring there is never voltage in your hot tub water. Don't let loose ground connections in your hot tub leak electricity into the water! Schedule routine hot tub service. 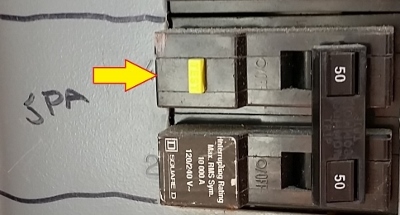 Hot tub ground connections keep voltage out of the water. When something "shorts out" it's also known as a "ground fault". A ground fault can mean electrical current flowing on the ground wires which can mean voltage in your hot tub water. The GFCI that protects your hot tub will trip immediately (within 5 miliseconds) and remove all power to your hot tub if it detects a ground fault greater than 0.005 Amps (5 miliamps). 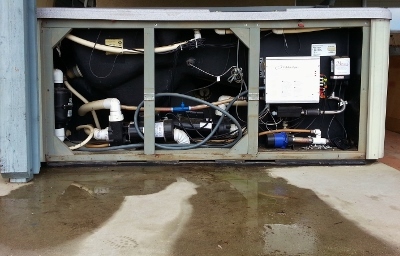 Your hot tub GFCI should be tested on a regular basis. Don't soak in shock-infested water! 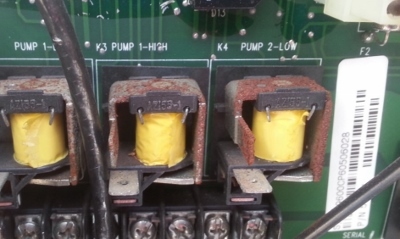 Test GFCI protection on a regular basis. Schedule a Routine Hot Tub Service. 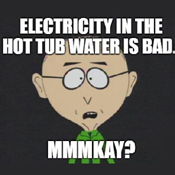 Electricity in your hot tub water is bad. Mmmkay? A big leak in your portable hot tub is usually pretty obvious. You see a big puddle next to the tub and when you lift the lid half the water is gone. When this happens, it's pretty obvious you need to schedule a repair. Most leaks in portable hot tubs are not so obvious. You may not notice small, hidden leaks because they may never leave a puddle outisde your tub and most hot tub owners assume the small water loss is due to splash-over or evaporation. 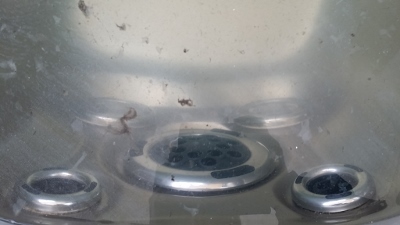 Small, prolonged leaks inside the cabinet of your portable hot tub create a damp environment that can rust out expensive, metal components such as pumps and circuit boards and can rust out metal frames, rot out wood frames and promote mold growth. Don't let small, hidden leaks damage your hot tub from the inside! Schedule a routine hot tub service at least once a year to find and fix small, hidden leaks. Most modern, portable hot tubs are sealed on the bottom in one way or another so water can pool up inside long before it makes a visible puddle or perpetual wet spot on the outside. 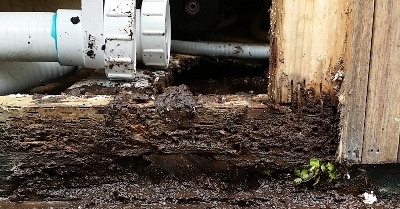 By the time water finally leaks to the outside, it usually means the entire inside rusted or rotted beyond repair. Small, slow, hidden leaks can saturate spray-foam insulation like a sponge. The perpetually wet insulation combined with heat creates a perfect environment for explosive growth of mold and mildew throughout the entire cabinet of your portable hot tub. If you're sitting near an equipment vent in a portable hot tub full of mold there's a pretty good chance the vent is spewing a plume of mold and mildew spores. If you turn on the air blower in a portable hot tub full of mold in mildew there's a pretty good chance you're inhaling mold and mildew spores that bubble up from the water just inches from your nose. Find and fix small, hidden leaks before they turn into big, expensive problems! Under ideal conditions, a rat can have up to five litters per year because rat gestation period is only 21 days! Each litter can produce 12 to 14 'pups'. Each new rat is sexually mature and can reproduce at 5-weeks-old! The inside of your portable hot tub is dry, safe and warm and usually filled with spray-foam insulation that makes digging tunnels and nesting chambers almost effortless. 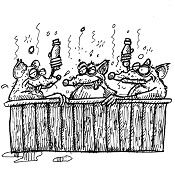 A single, male rat can establish a colony keeping several female rats in separate corners of your hot tub connected by tunnels so your tub can turn into a non-stop rat factory in just one season. Rats chew on things because their incisor teeth never stop growing so they must constantly gnaw to keep these teeth worn down. This is why rats chew on everything everywhere and can easily chew a hole right through the cabinets of most modern, portable hot tubs. 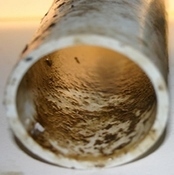 Rats chewing on pipes usually cause extensive damage which can mean multiple leak repairs over several days or weeks as all the leaks are found and fixed. 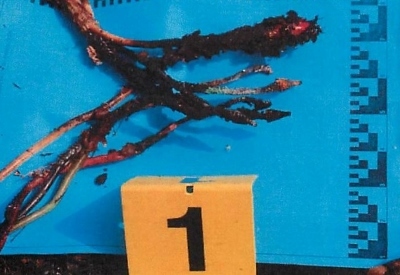 Leaks caused by extensive rodent damage are often not worth fixing. 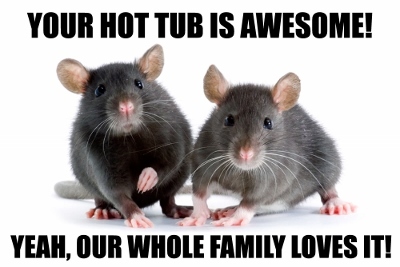 Rats chewing on pipes can cause leaks that can ruin your hot tub so you have to haul it away but rats chewing on wires can also cause electrical fires that incinerate your hot tub right where it sits. The hot tub above was shut down for a year which gave a dirty, rotten rat time to chew all the insulation off the input power wires. The Fire Marshall determined the blaze had smoldered for several hours before finally burning a hole through the cabinet and erupting into hot flame and thick, toxic smoke as the various plastics ignited. Luckily, the fire department was equipped with foam because the pile of melting plastic shaped like a hot tub burned so hot water wasn't putting it out.